Commonwealth has taken out an unprecedented Division 1 Pennant Triple Crown by winning the Women’s, Men’s and Colts finals played at the Keysborough Golf Club on Sunday. The Men’s side accounted for The National 4&3 in a tightly fought final. The National were up early in the final with Andrew Villenger defeating Commonwealth’s Garry Sluce 5&3 in the number 7 match before Commonwealth’s No.6 Mitchell Venables levelled the matches following a 2&1 win over Liam Reaper 2&1. After The National’s Clay Nicholls and Tom Bayliss scored respective 2&1 wins over Commonwealth opponents Liam Gransden and Tom Couling the final look to be swinging towards a victory for The National but Commonwealth’s top order came to the party with some sensational individual performances. Rookie professional and former Victorian State player Frazer Droop defeated The National’s No. 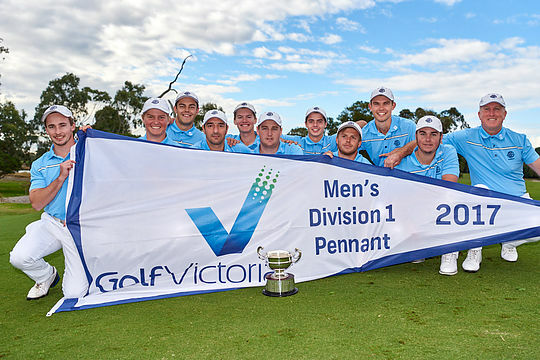 3 Tom Limon, 7&6 while 2014 Victorian Amateur Champion Zach Murray was all class taking down 2012 Australian PGA Champion and The National’s No.2 player, Daniel Popovic, 6&5. With the final in the balance with both teams on three wins, the focus turned to the top order encounter between professional Mitchell Brown and current Australian Boys Champion Cameron John. Brown, who recently claimed his China PGA Tour card, was out early with some stunning driving winning the first hole, however John quickly responded with classic match play from the fairways to the green coupled with some impressive putting. By the turn John had edged his way to a two up lead and never looked back. John, who plans only to play in the main US amateur events this American summer and will not defend his Scottish Open Amateur title, proved too good for Brown claiming the match and the final for Commonwealth with an impressive 4&2 victory. This was Commonwealth’s 14th Division 1 title and the Club’s third Division 1 flag in three years. “We, as a club, take our pennants very seriously and aim at giving a pathway to all these kids,” said Team Manager Michaell Giulieri.